Changing the way the world counts cash. Retailers know that handling cash can cause headaches. It’s time-consuming, risky and full of opportunities for human error. Managers often spend hours a day counting and recounting cash and preparing bank deposits. With each variance, they have to figure out whether an honest mistake was made…or a not-so-honest mistake. And business owners may second guess whether the mistakes are even being made by the cashiers getting the blame or by not-so-honest managers. Well, thanks to Armor Safe Technologies’ line of smart safes, these headaches and hours a day of wasted time can be avoided. Why choose an Armor safe? An Armor safe can save your business time and money while improving efficiency and productivity. With industry-leading security features, built-in counterfeit detection and incredible ease of use and configuration, an Armor safe is the ideal solution for any business that wants to streamline its cash management processes, regardless of size or industry. Cashiers feed currency into casino-quality bill acceptors and the notes are verified by denomination and immediately stored in the safe. From the moment the customer pays until the cash is deposited in the safe, each employee is solely responsible for the money they alone handle. Armor's smart safes integrate the best bill validator technology available, not only to to ensure reliability and accuracy, but also to provide the greatest protection against counterfeit bills possible. By deploying an Armor safe near the point of sale, cashiers can use their Armor safe to immediately validate large notes received from their customers. The technology used in our safes is vastly superior to relying on UV lights or counterfeit pens. Our solution is so accurate that many banks and armored car companies will guarantee the value counted by our safes, protecting their customers from the risk of discrepancies. Securing cash is perhaps the most important function of an Armor safe. We designed our safes with numerous security features to protect your cash from both external theft and internal theft. After cashiers deposit money in the safe, managers never need to recount, or even touch, the deposit, creating a much safer environment for everyone and saving hours a day of the manager’s time. Our safes are laser cut with incredible precision at our state-of-the-art manufacturing facility in San Antonio, TX. The low tolerances result in narrow gaps between the door and the body of the safe making it very difficult for assailants to introduce a pry bar in the gap and force entry. An interlocking back flange ensures that the door remains securely closed even if the hinges have been completely removed from the safe. When designing our safes, we're committed to using high quality materials in order to make our safes highly resistant to attack. 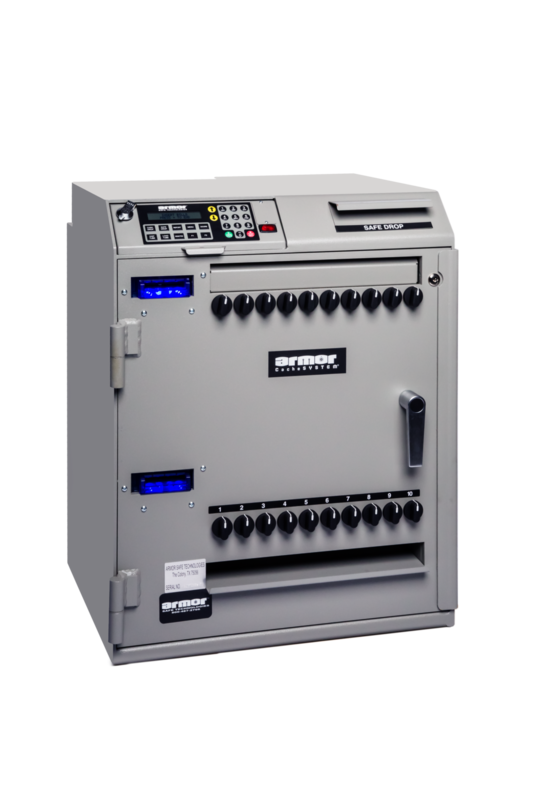 Our safes exceed the standards for b-rate safes. Instead of the cheaper mild steel used in many safes, we've selected Grade 80 steel for its high strength-to-weight ratio, excellent cold-forming characteristics and enhanced atmospheric corrosive resistance. Because Grade 80 steel is significantly stronger than mild steel (90 ksi versus 55 ksi), it provides us high strength in thinner sections at a lower weight. High security locks & keys. We use high-security Medeco® keys making unauthorized key duplication nearly impossible. Our standard boltwork features three 1-inch chrome-plated locking bolts equipped with a spring-loaded relocker, eliminating the risk of the door being closed but left unlocked. A drill-resistant hard plate protects our boltwork and the high-quality LaGard® lock that secures our vault doors closed, reinforcing our safes against drill attacks. The safe can be configured so nobody on site can open it without either waiting through a configurable delay period or, if armored car services are used, the presence of both an authorized employee of the store and the high-security key the armored car driver brings to the location. These security measures and many more act as a significant burglary deterrent. Would-be criminals aren't comfortable waiting through long delay periods or dealing with a team of armed armored car personnel. Every time users log in, their interactions are electronically recorded and stored in memory. More than 30 reports are available to provide powerful insights during an investigation if needed, but day-in and day-out, the most important information is effortlessly available. No more counting & recounting. Armor's smart safes provide real-time visibility of your cash deposits, presenting the information in a number of ways. The traditional cash till closeout process is often stressful and time consuming. Armor safes automatically maintain a perfect count of cash deposited by cashier, ready to be printed at a moment's notice. The reliability of our high-quality MEI validators ensures that the printed totals are error free. Load in minutes. Dispense all day. 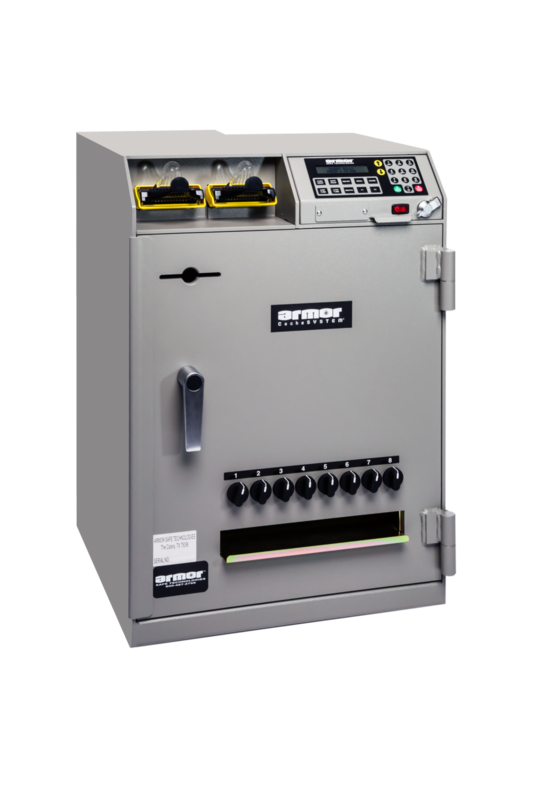 With Armor's CacheSYSTEM 7000 Series safes, a manager or other authorized personnel can load a change fund of coins and rolled currency into the safe to provide all employees secure, interruption-free access to change throughout day. Most cash-accepting businesses can expect to receive a return on their investment in 6 months or less. Since each interaction with the safe is electronically recorded, the data can also be securely transmitted in real-time to key stakeholders for enterprise-wide financial reporting. Participating banks and armored car service providers can receive a view of the data tailored specifically for them, allowing them to offer services to their customers never before possible. Banks can provide their retail clients with same-day provisional credit for the money in Armor’s safes before the cash is physically removed and transported to the bank. Say goodbye to the dangerous practice of carrying big bags of money to your bank's night deposit box after closing. Introduced in the late 1990s, our original BiComm specification enabled real-time communication between Armor's CacheSYSTEM safes and our early partners. With BiComm 2.0, we redesigned BiComm from the ground up to be more powerful and efficient than ever, empowering our partners to extend the functionality of Armor safes further than ever before.